One of my favorite food-related memories (yes, I have a separate category for food memories) from my childhood is my mother baking whole chickens in the oven. They cooked for hours, and it made the whole house smell delightfully savory. Then my mother would set them out to cool for a while before picking the chicken off the bone. That’s where I came in, sneaking bites here and there of the warm, moist chicken. Especially the dark chicken. Mmmm. My mother frowned on this practice, since she didn’t want my fingers all over the chicken and didn’t want me spoiling my appetite, but she usually still let me eat more than was probably good for me. She’s a good mother. When I got married, I wanted to roast chicken myself, since I know it’s cheaper to buy whole chickens, and the meat, broth, and bones can all be put to good use. 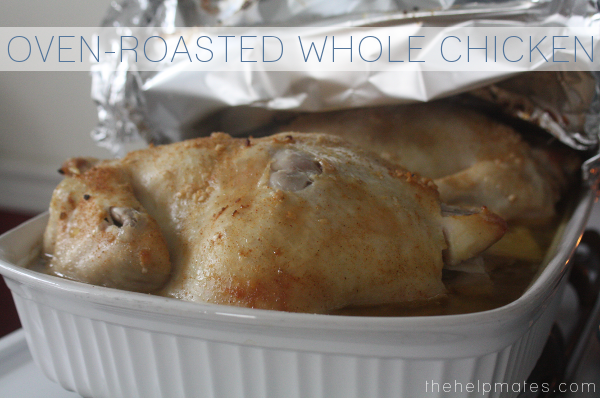 It’s also helpful to have pre-cooked chicken on hand in the freezer for those quick dinner nights. This is a super simple recipe and isn’t even a whole meal, but I had to call my mother and get instructions for how to do it, so I thought it might be helpful to share the knowledge. Enjoy! Preheat your oven to 325 degrees. 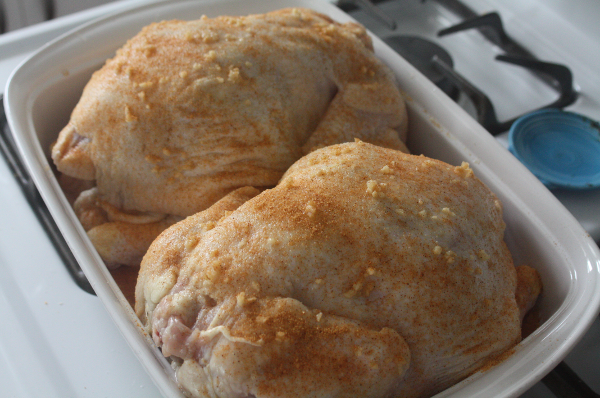 Rinse both chickens and place them in a 13×9 inch baking dish. If they don’t fit in one dish, you can put them in two separate dishes. Chop the onions, and stuff one garlic clove and half of each onion inside each chicken. If you have leftover onion, spread it in the dish around the chickens. Melt the butter and pour half over each chicken, then season with salt & pepper and seasoned salt. I use Lawry’s Seasoned Salt. And don’t let my picture confuse you, I put garlic on the outside because I didn’t have any cloves on hand. Once you’ve seasoned the chickens, use foil to make a tent over them. It doesn’t need to be sealed with foil, just cover it and seal the long sides of the dish. Bake the chickens for about 3 hours. Once they’re done, take them out and let them cool for 30 minutes to an hour. Remove the skin and set it aside, then pick off the chicken. I usually keep the light and dark chicken separate, since I use them for different recipes. 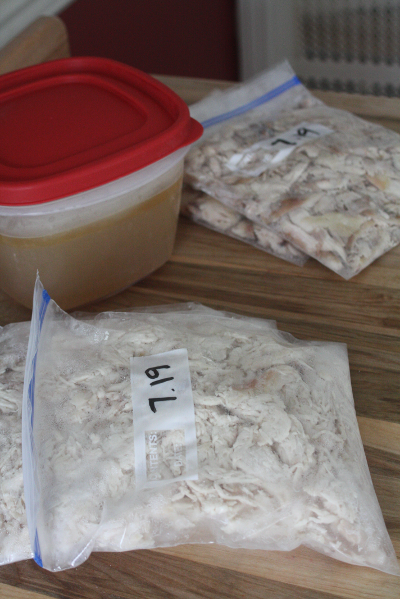 If you want to make bone broth, seal the bones and the skin in a ziplock bag (you may need to use several) and freeze them until you’re ready. If not, just throw them away. Put your chicken in ziplock bags, about a pound in each bag. 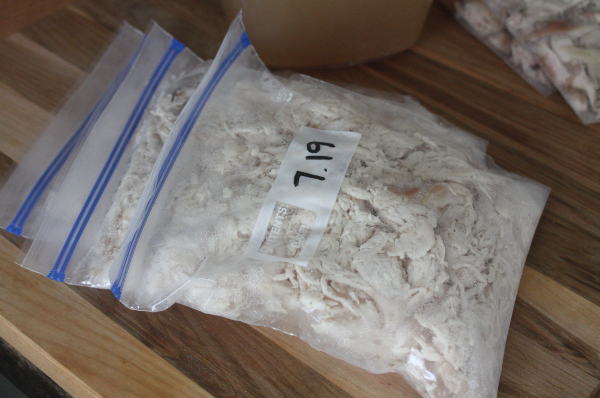 This time I ended up with 3 bags of white chicken and 2 dark, but it varies depending on the size of the chickens. Flatten out the bags so they’ll store well in the freezer. For the broth, pour it from the dish through a strainer over a bowl so that the bits of bone/fat/skin that you didn’t get out won’t end up in your broth. Then pour it into a ziplock bag or tupperware and freeze. Now you have five(ish) pounds of meat, four(ish) cups of broth, and bones ready for bone broth. I’ll be posting my bone broth recipe next week, and also be on the lookout for my gluten free chicken noodle soup recipe, using the broth and chicken.